Behind the Scenes on Great Day Green Country and Bootcamp Tulsa’s Biggest Giveaway Yet! From hair to skin to staying in shape these are our readers picks for the business that helps them look and feel their best. Bootcamp Tulsa Landed The A List in 3 categories. Bootcamp Tulsa was named the “A List” in Weight Loss, Women’s Only Exercise and Gym. In a ceremony that mimicked the Oscars and MTV Music Awards, 11 category winners of the second annual Tulsey Awards received a golden bronze Driller statuette Thursday evening in recognition of their entrepreneurial spirit. Coach JC named one of 40 Under 40 of The Year Award! The 40 Under 40 Class of 2010 represents a diverse group of young professional who are moving up and giving back. The Founder of BcT, Coach JC received the award on behalf of the BcT Team..
Coach JC and the BcT Team delivers weekly lifestyle, fitness, and weight loss advice and a weekly video Transformation Tip to the moms of the 918 as the Fitness Expert. Coach JC featured on News on 6 as he takes 500lb Tom Basler on a transformation journey for 12 weeks. “It’s about getting people moving again. So many people have lived a sedentary lifestyle and they’re motivated to get fit, lose weight, they may even have some knowledge. Our goal is this, let’s give them a game plan,” said Jonathan Conneely, of Bootcamp Tulsa. Tulsa World, Okla. Publication: Tulsa World (Oklahoma) Date: Thursday, August 13 2009 Time magazine stirred up controversy this week with a cover story claiming that exercise won’t make you lose weight. 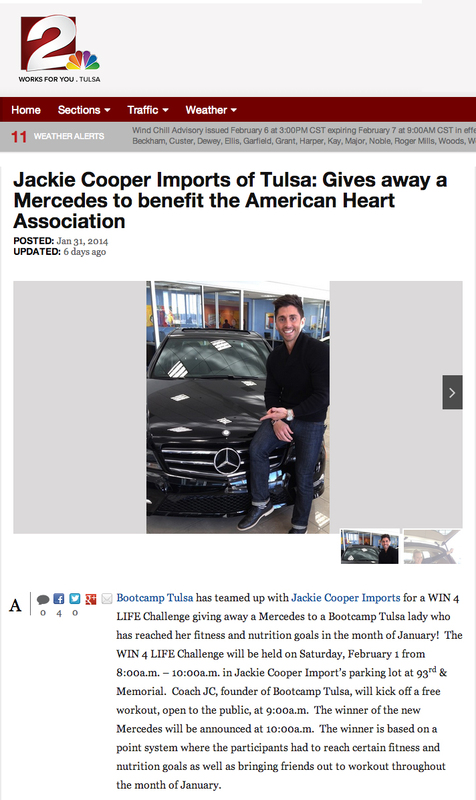 Tulsa World turns to Coach JC to get his thoughts on exercise and Time Magazine’s claims..
Jonathan Conneely, the founder of Bootcamp Tulsa will be signing copies of his highly anticipated book on April 17 from 1-4 pm at Borders at 81st and Yale. As a thank you for attending the book signing, Coach JC would like to extend Two Free Weeks of Bootcamp Tulsa to each individual who purchases a book that day.